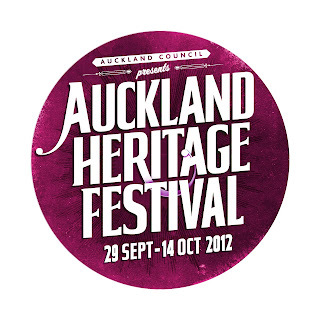 From 29 September to 14 October 2012, Auckland Libraries will be taking part in and celebrating the annual Auckland Heritage Festival. 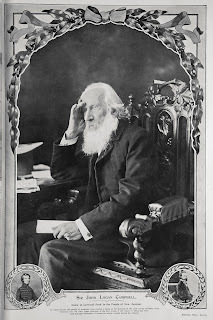 One of the festival themes this year is Sir John Logan Campbell (1817-1912), an influential figure in New Zealand history with a long association with Auckland. As promised in an earlier post (6 July 2012 for those of you who want to look back! ), work has been going on behind the scenes to create something new and different using the innovative tools available on the Historypin website .... So, from the start of the festival (and beyond) you will be able to access a special online tour depicting the heritage sites and places associated with Campbell. 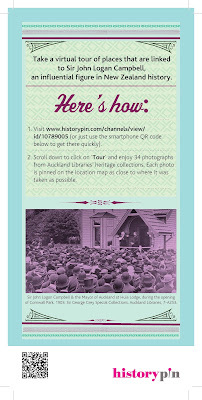 This bird's eye virtual tour includes a selection of Auckland Libraries heritage photographs, illustrations and archival documents which relate to Campbell, whose mark can still be seen on Auckland today. 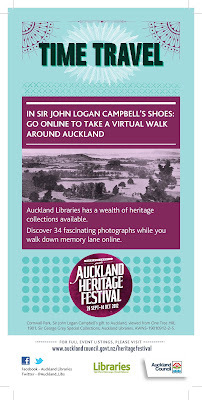 The tour literally lets you 'travel' around Auckland in Sir John Logan Campbell’s shoes! 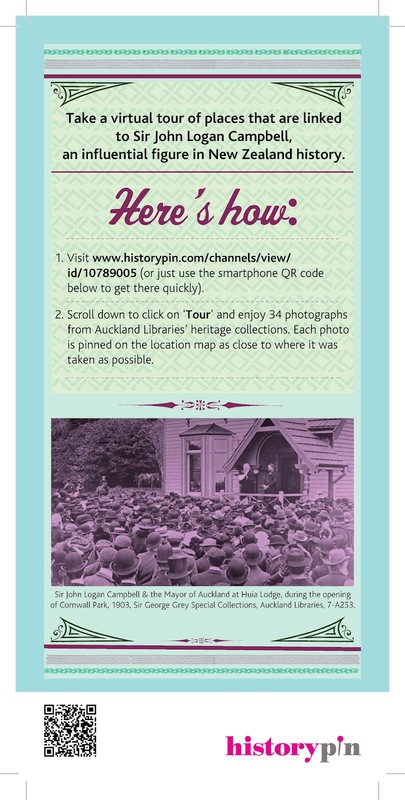 To access the tour go to the Auckland Libraries, Heritage and Research channel/profile page on the Historypin website, scroll down the page and click on the Tours tab. Although the festival doesn't officially start until tomorrow, for those of you who are keen, you can access the tour today and be one of the first to experience it! There are also a large number of other Auckland Libraries events taking place during the festival. This includes Black and White and Read All Over: Auckland Newspapers at Auckland Libraries, a newspaper tool kit (just bursting full of tips for you to try), which will be published at intervals during the festival. A link to the whole newspaper tool kit will go up on this blog at the end of the festival. You will be able to find this under a new Resources tab at the top of the page, which will appear in a few weeks time (keep an eye on this, we will be adding more resources in the future). 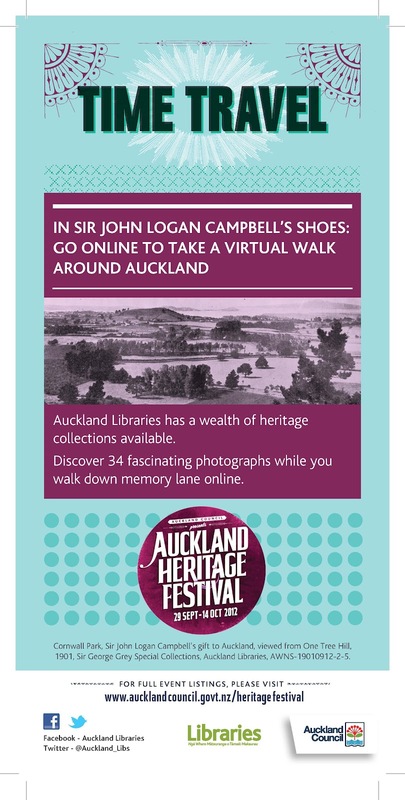 Find out more and search for Auckland Heritage Festival events including Time Travel in Sir John Logan Campbell's shoes and Black and White and Read All Over. 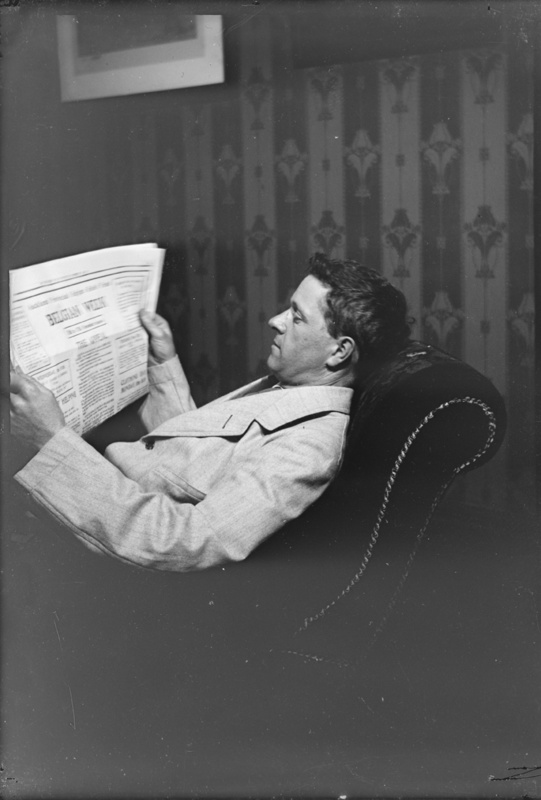 You can now view 'Time Travel in Sir John Logan Campbell's shoes' as a collection as well as a tour. The Jennings Family Tree - owner found!